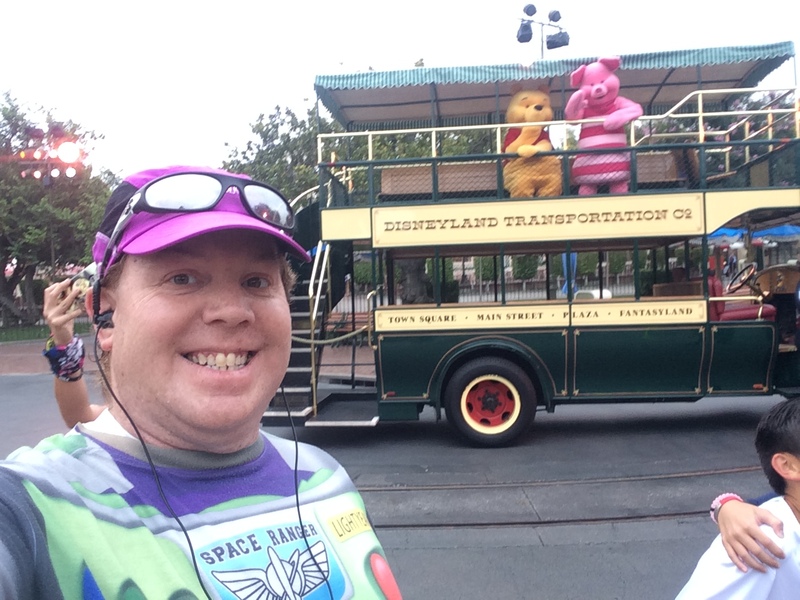 Disneyland 10K – Not the 10K I Wanted, but Still Fun! 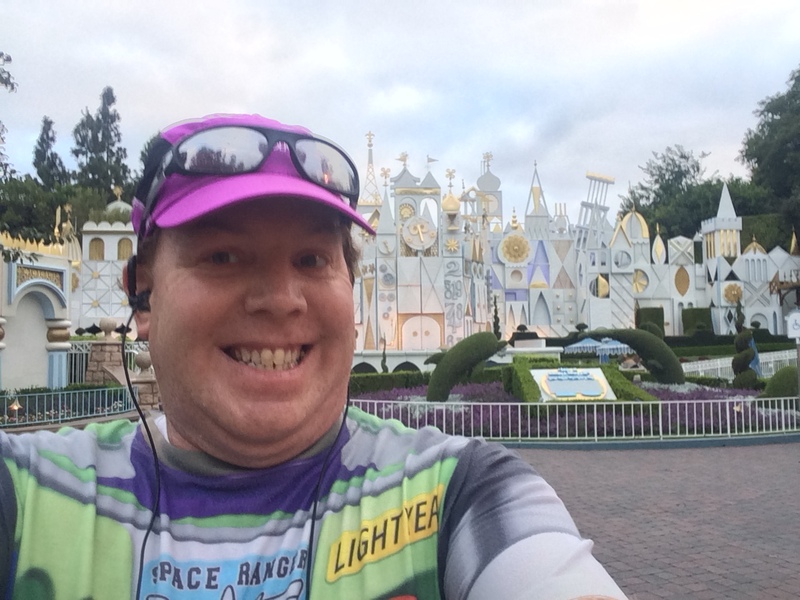 When I arrived for the Disneyland 10K, I was determined to treat this run as a training run. I knew that I wouldn’t be seeing a 10K PR, like I had hoped for when I signed up. But, I did have a time goal that would have been respectable. 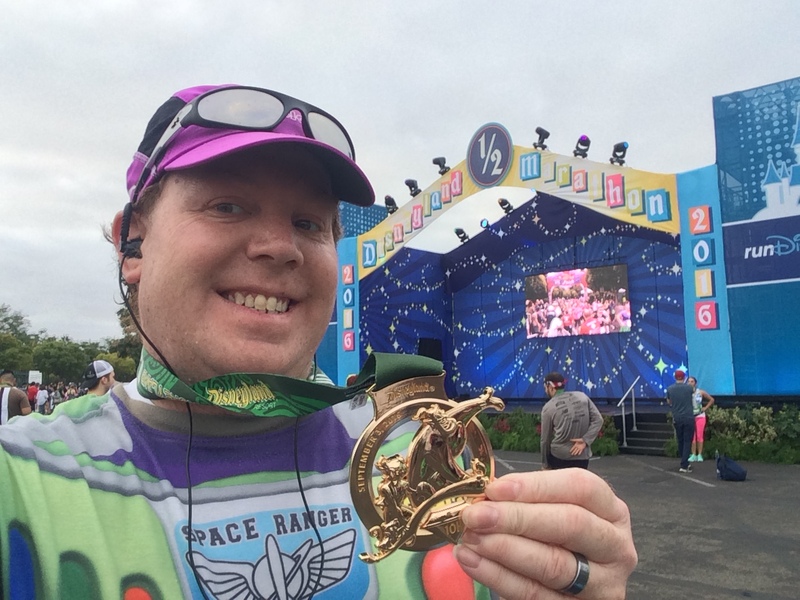 I treated the Disneyland 5K as a fun race. Time was irrelevant to me. This race was different. As I waited in the starting corrals, I kept telling myself that this was a training run with benefits. When I arrived, I saw my friends AJ and Ivie and had fun chatting a bit with them. Once in the corrals, I had a great conversation with a few people who were running their first 10K’s and one person who was determined to run the Boston Marathon as a charity runner at some point in her life. We talked about how hard it is to qualify for Boston and some of our marathon experiences. I love being with my runner peeps! There aren’t many pics from the start of this race because I intended to treat it as a training run. When I started the race, the plan was to run 30 seconds, walk 90 seconds for mile 1. Then, switch to a run 30 seconds, walk 60 seconds the rest of the way. If at the mile 5 marker, I was at 1:02:30 or quicker, I would possibly switch again to a run 45 seconds, walk 45 seconds and see if a PR was going to happen. 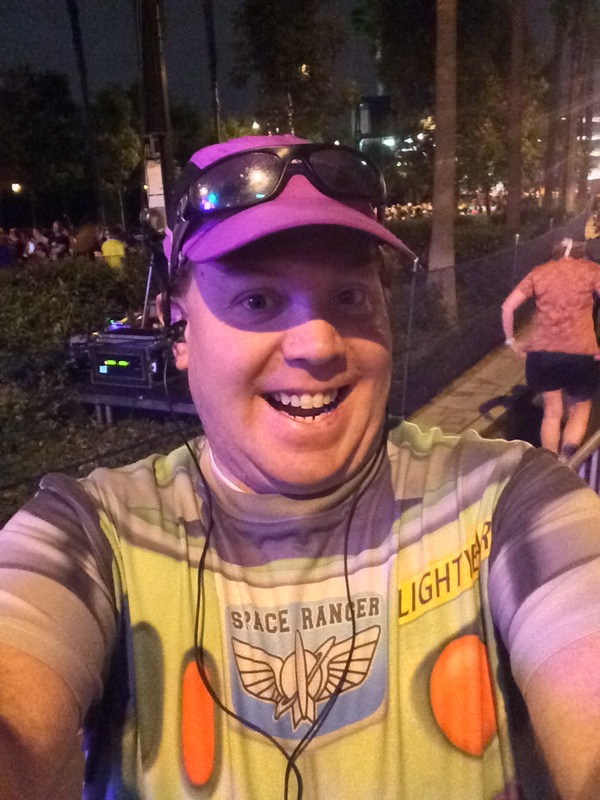 Another thing I want to mention before getting into the race itself…At the Disneyland 5K, I had trouble getting the screen on my watch to light up so I could see when to run and when to walk. In training, all I had to do was touch the screen and it would light up. Things worked really well in training. Not so much during the Disneyland 5K. So, my plan was to use both my Garmin watch and the Nike Plus app until I could read the watch alone. It seemed like a good idea. However, it didn’t workout so well. The Nike Plus App I had on my phone had changed and I didn’t notice until I was in my corral. I tried to get it started when I was crossing the starting line, but it didn’t go. My watch went fine. I started the race not knowing exactly how long I had run for. I ran up until the point where we had turned to go backstage at DCA the day before. It was more than the 30 seconds I had planned. However, without any timing device at my clear view, I thought this would be a good way to go and get clear of some of the crowd. Then, I could take a walk break and try to get the Nike Plus App working. I was able to do that. However, it got working at a rather odd point. I made the decision to just use the time on the Nike Plus App until I could read my watch. Once I got the Nike App going, I started running my intervals. Run 30 seconds, walk 90 seconds. After a couple run intervals, I settled down a little. We came to the mile 1 marker at a little different spot from the year before. In 2015, the sign appeared before we turned up into the Anaheim Convention Center. This time, it was a little bit up into that turn. It was a good spot for it. My time at the end of mile 1 was 12:06! I felt pretty good about this time. It was right on point with my training runs. The bummer was that I wasn’t feeling the switch to a 60 second walk break. So, I broke the plan and kept the 90 second walk breaks going in mile 2. This is the last mile outside of the park. I knew right where the mile 2 marker was going to be. We ran through the Anaheim Convention Center outside all the way up to Harbor Blvd. The run 30, walk 90 was feeling pretty good. I was feeling strong. However, I could see at the quarter-mile checks I was falling a little behind. Although, I didn’t know exactly where I was during the mile because I was using the app, the quarter-mile splits were not in my favor. As we ran down Harbor Blvd., I knew I needed to switch to the 60 second walk break as soon as I got to the mile 2 marker (which is what I did). I finished mile 2 in 12:57 for a cumulative time of 25:03. There goes the PR hopes. What can I say? I caved. My time wasn’t looking great anyways. Also, the short wait (around 5 minutes) was just too tempting. So, I caved. Did it hurt my overall time? Yep. 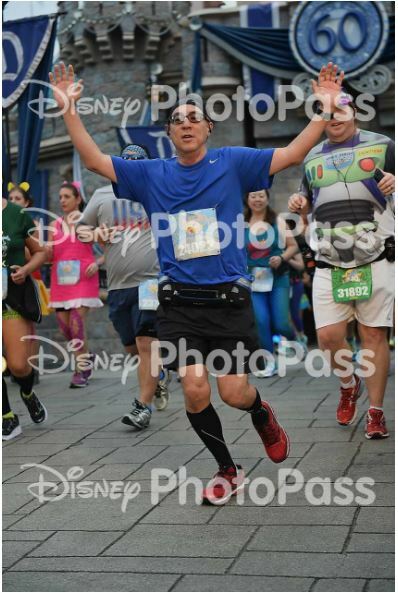 Even though I knew the PR attempt was officially over with this picture, I still hoped I’d keep the race respectable and hit the real time goals I expected. 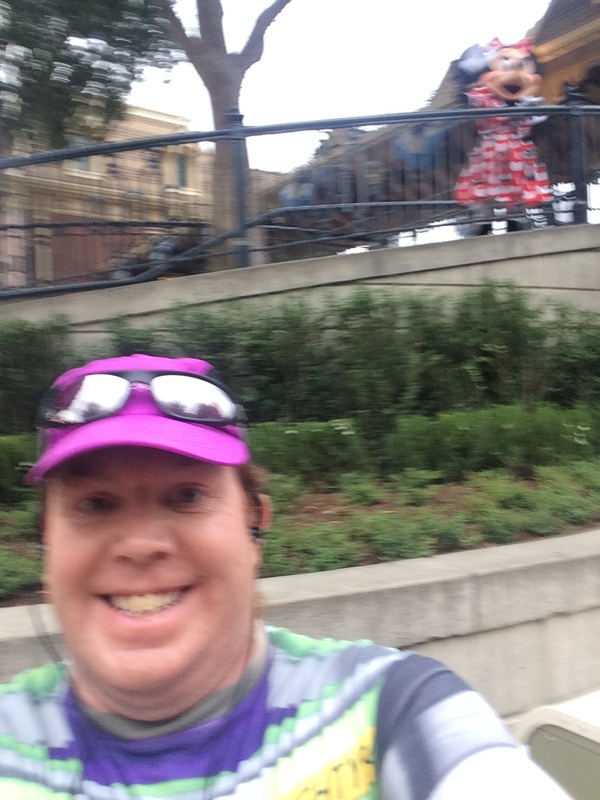 After the photo, I tried to get back into the run/walk pattern of 30/60 as we made our way around the Paradise Pier area. By this point, I was able to see my watch. So, I switched off the Nike Plus App and made some adjustments to get back in step with where my run intervals should have occurred. This involved a few longer run intervals. But, I got there. The Mile 3 marker was in a different place than I was used to on this course. I was used to seeing this marker right by Soarin’ Over California. This time, it came earlier. I finished mile 3 in 13:58 for a cumulative time of 39:01. This was more than a minute per mile slower than I wanted. However, I just kept trucking. When I crossed the 5K mat, I was a little bummed with my time. But, I kept going. Run 30 seconds, walk 60 seconds. Since I wasn’t stopping for pics, I was pleased with how well I was keeping to these intervals. The downside is that I often was finding myself running slower than I would have wanted because I couldn’t pass the slower runners. Walls of run/walkers can be frustrating. I mean, I knew they were running (for them). It’s just that it was slow for me. We made our way up the Condor Flats, past the Carthay Circle Restaurant and down Hollywood Blvd. in Hollywood Land. As we passed the Art of Animation Building, I saw Judy Hopps from Zootopia. The line was longer than the Mr. Incredibles line. However, I was still shooting for a time of 1:20:00 or faster. So, I kept running. Given my finish time, I now regret not getting in that line. I mean, if I was going to end with a slow time, this would have been a really cool picture to get. Oh well. As we passed the Tower of Terror Hotel, I was tempted to stop for a pic. Nope. We headed backstage at DCA and onward to the tunnel that connects backstage DCA with backstage Disneyland. My time check was getting frustrating. The mile 4 marker was at the other end of the tunnel. Again, it was different from previous years. My time for mile 4 was 13:09 for a cumulative time of 52:10. This is where my race started to turn from a training run to a fun run. I still had some hope of beating 1:20:00. But, my focus was cracking. Mile 5 was almost entirely backstage. It was really disappointing. Another disappointment? The lack of running space. In mile 5, my frustration with slower runners was growing. I tried so hard to make up ground. But the walls of runners who were slower than me kept slowing me down. I finished mile 5 in 13:50 for a cumulative time of 1:06:00. By the time I got to the mile 5 marker, I did the math in my head. A 1:20:00 was extremely unlikely. If I was on a true training run, I could have finished in that time. But, the walls of walkers/slower runners had destroyed my confidence that I could do it at this race. By the mile 5 marker, I was done with racing the race. I made the decision to have fun with the remaining 1.2 miles. After all, I was running through Disneyland. So, I didn’t want this race to leave a bad taste in my mouth. So, mile 6 was run when I wanted to and walk the rest. 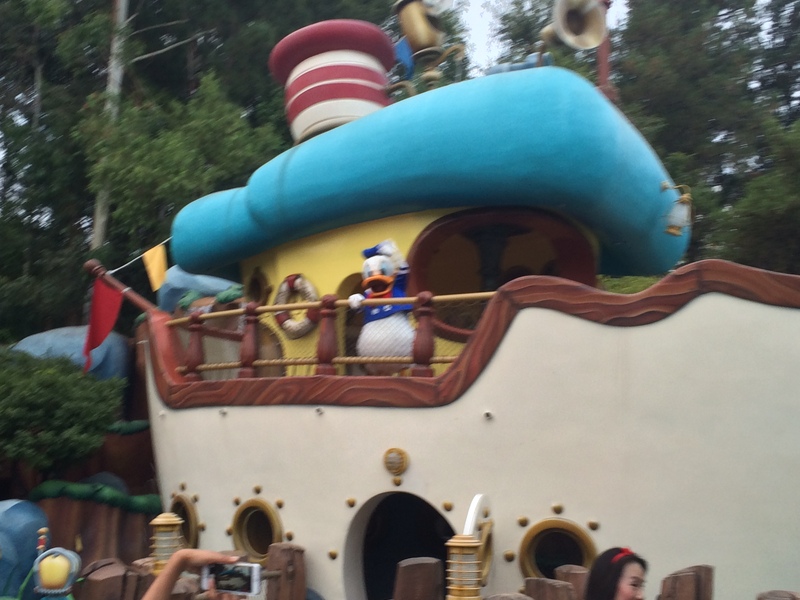 As we made our way back onstage at Disneyland, there was Donald on his ship! I should have stopped for a selfie. However, I was still making that decision to let go of any time goals here. So, I just grabbed a quick pic instead. 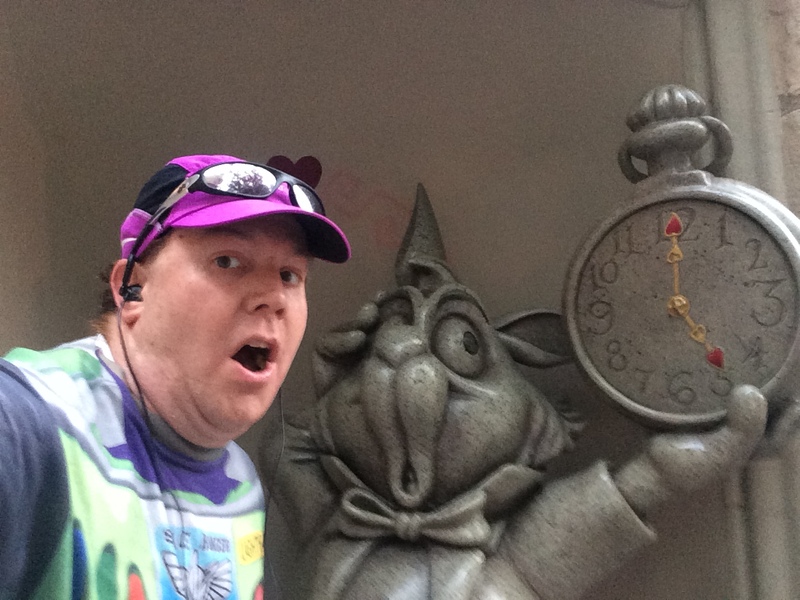 On a walk break, I did grab this selfie in Toontown! I ran down under the train tracks to leave Toontown and up the other side. It’s A Small World isn’t as cool in the non-Holiday’s version. But, since I was going to have fun, a selfie was a must. 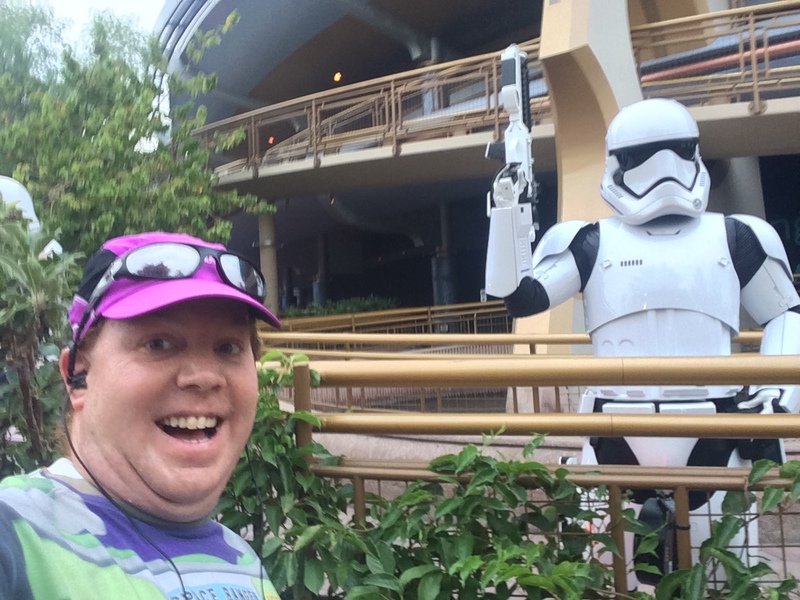 In Tomorrowland, I ran into a couple of First Order Troopers. In retrospect, I shouldn’t have gotten in line as there was no one to take a picture of you. So, I wasted a minute or two before realizing I could have just gone for the selfie all along. Oh well. More wasted time. 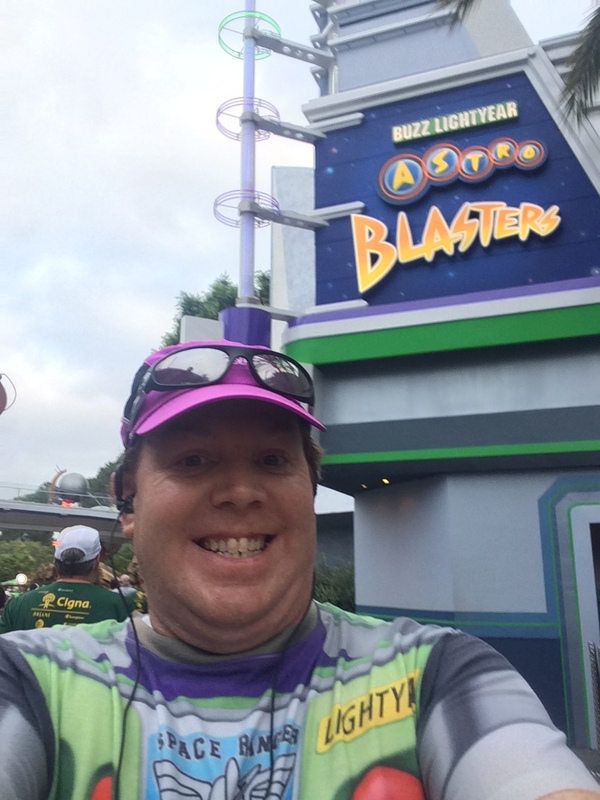 Since I was running as Buzz, I couldn’t resist the urge to get a selfie by the Buzz Lightyear Astro-Blasters. 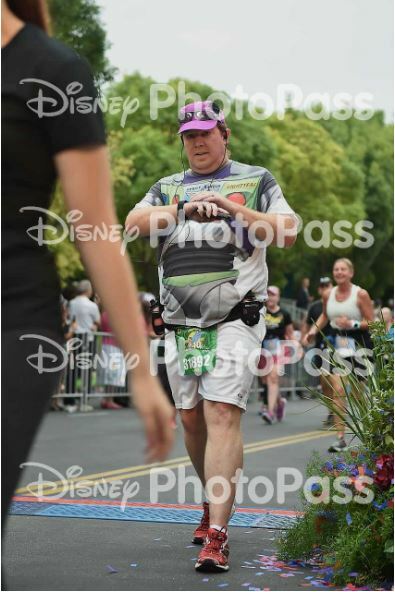 As we made our way back to Fantasyland, I realized I was terribly late for a great finish time. So, why not have some fun along the way! As we made our way through Sleeping Beauty’s Castle, I wondered if the Disney PhotoPass Photographers would get a picture of me running with the castle in the background. This is what I got. The dude in blue, put his hands up right as we got to the PhotoPass Photographer. Needless to say, I did not purchase this pic. On the way around the hub, Pooh and Piglet were on the double-decker car that takes guests up and down Main Street U.S.A. So, I had to stop for a quick pic. 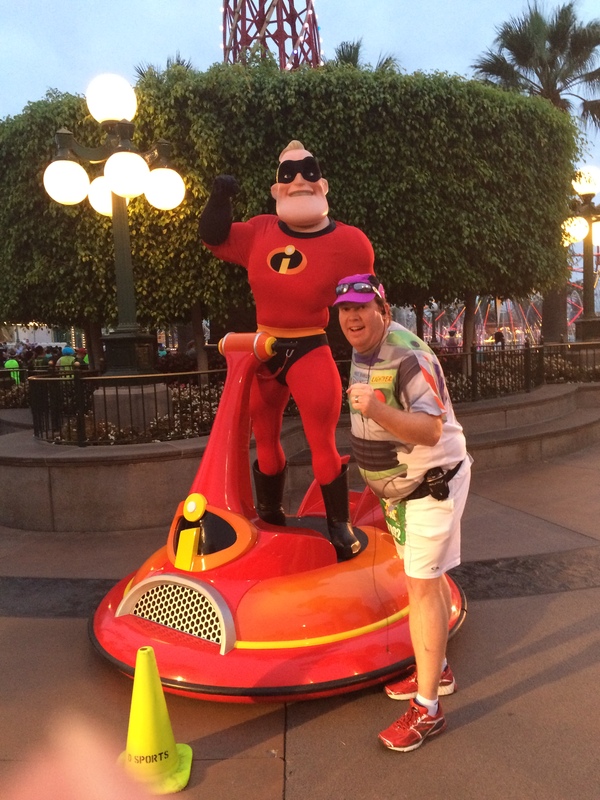 One thing you may have noticed in this report is the lack of places with a Disney Cast Member to take a picture of you with the various characters on the course. This was something I kind of liked about the 10K. There were more characters on the course and shorter lines. At the other end of Main Street U.S.A. Minnie Mouse was at the Train Station. This is the best of the 3 or 4 selfies I took. From there, we exited Disneyland and made our way through Downtown Disney. This part of the course is fun because there are a lot of people out to cheer us on. There are also folks who have already finished the 10K and are trying to get back to their hotels and/or theme parks. Either way, it makes for a fun finish. 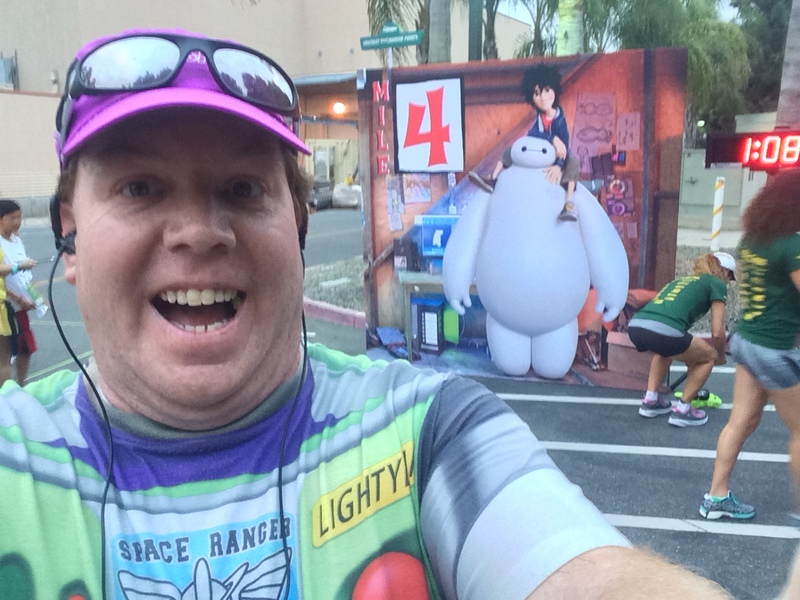 I decided to get back to my regular intervals through Downtown Disney. It felt good to get back to them! Even with that, the 6th mile took nearly 16 minutes. Once I passed the mile 6 marker, I had one final walk break. Before getting to that mile marker, I decided that I’d run the final tenth of a mile (just past the ESPN Zone). Normally, I don’t run this far out to the finish. However, I felt like I had it in me and I did! As I made my way to the finish line, I saw Genie on the left side. So, I headed over and gave him a high-five. Did PhotoPass capture this awesome moment? Nope. This is what they got. I have 4 pictures of me stopping my watch. Zero pictures of me actually crossing the finish line. This is why I didn’t purchase any PhotoPass pics for the Disneyland 10K. It wasn’t the race I had wanted it to be. However, I still had major fun with the race! So, here are the splits according to my Garmin. My official finish time was 1:26:01. If I hadn’t stopped at for the picture with Mr. Incredible and the First Order Trooper, I could have easily shaved at least 6 minutes off my finish time. So, this finish time wasn’t as bad as it looks. I need to get more aggressive when I run the Avengers Super Heroes Half Marathon. I need to be okay with saying “excuse me” or “on your right/left” to get through walls of walkers and/or slower runners. This was super frustrating to me during this race. It’s not entirely the fault of those who created those slow walls of people. Many of the times I got to those walls, it was of people who were running. They were merely slower than I am when I run. At the Avengers Super Heroes Half Marathon, I need to commit to a plan for the race and never give up on that plan until I get to the finish line. I don’t want to miss a time goal because I broke the plan. 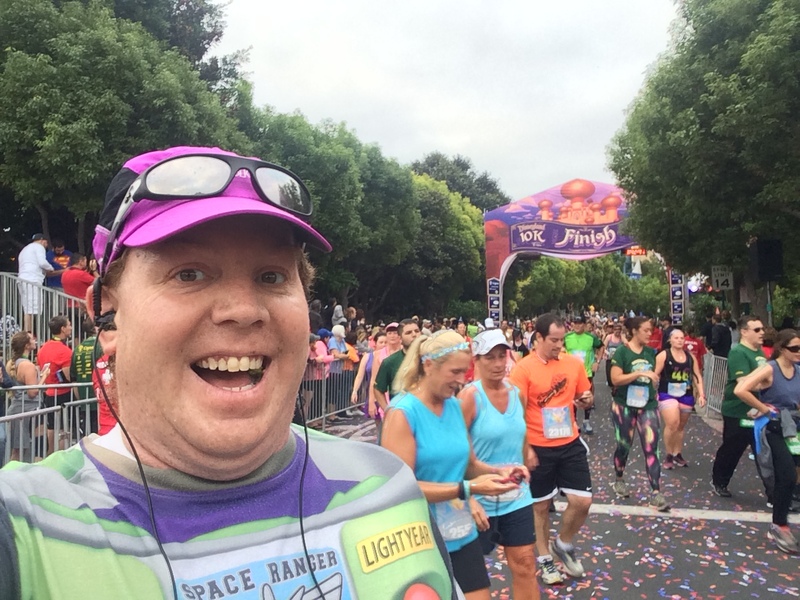 Both the Star Wars 10K and the Disneyland 10K this year saw me break my plan and it cost me. With Avengers, I need to be okay with skipping character photos and other photos in the parks. 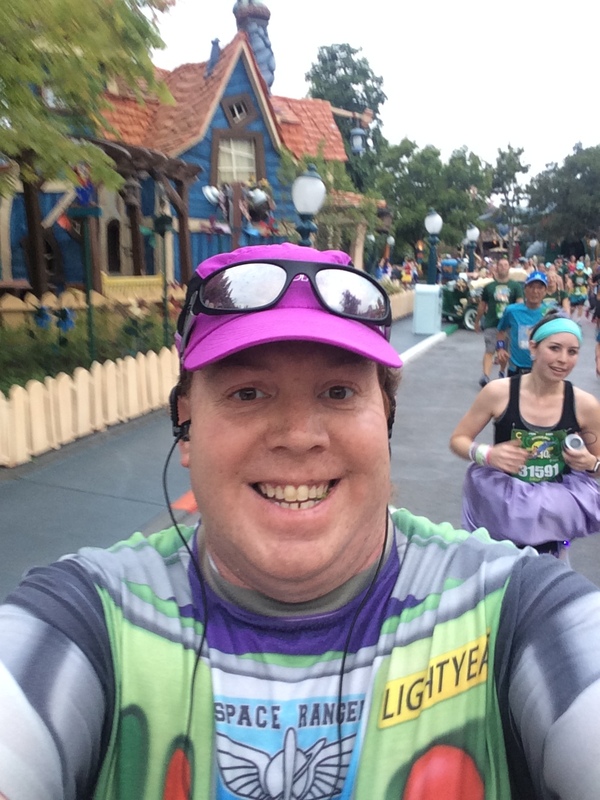 I’m giving myself permission to stop for 6 selfies in the race (which I’ll talk about closer to race day). Races through theme parks will slow your running pace down from training. Even bad races have the opportunity to be huge learning experiences. If I get that half marathon PR at Avengers, like I want to, my failure at the Disneyland 10K will be the reason why. By not getting a 10K PR, or even hitting my goal time, I feel even more motivated to chase down that half marathon PR at Avengers. Did you not do the half marathon? challenge? Not this year. The Dumbo Double Dare was priced too high..,$350. So, I ran the 5k instead. I love the Disney races! I’m signing up for WDW’s Goofy Challenge in 2018. Good luck in your training! 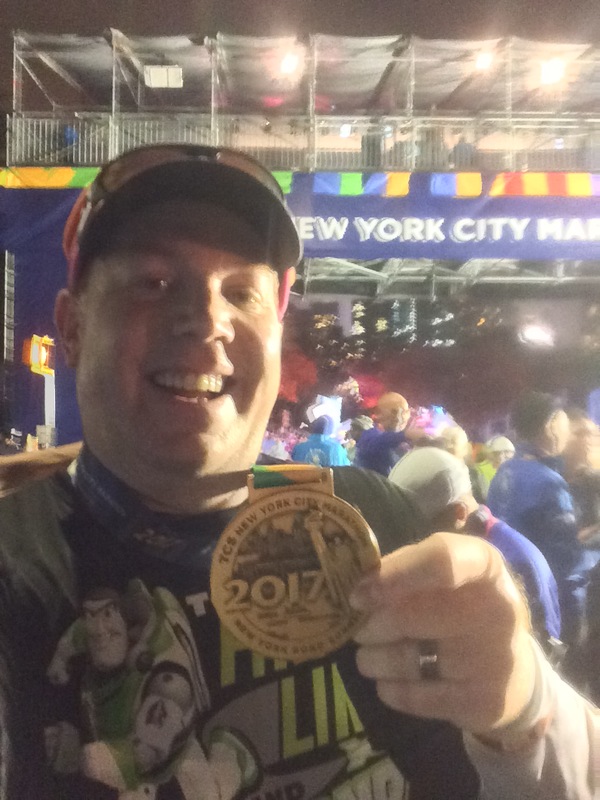 If the money is there, I’m thinking about doing the Dopey Challenge in 2018! I have not done Dopey before. It will be a one and done experience. I totally agree with you. 4 early mornings will be the hardest part for me. I feel your frustration. The worst part for me was that backstage portion between 4 and 5, right before we got into Toontown. It was very narrow and everyone was walking. I finally just gave up trying to run through. Also, I gave the Genie a high-five and was so excited that they got a picture because the photographer was RIGHT THERE. Did they get it? No. But they did get some other pretty cool pictures. I was just really disappointed that they missed this one. Yep…between mile 4 & 5 was the worst stretch for crowding for me as well. Also, if they’re going to have characters out at the finish like Genie, there should be a photographer assigned just for pics of that character. We started in the last corral, and surprisingly it wasn’t AS crowded as I thought it was. The walls of runners and walkers is tough. People assume others are just being rude and walking 10 across and such, but you hit it right on the head–some people are just slower. I also found that people built a “running wall” across unintentionally by lining up with people not in their party, thus not even realizing they were blocking the way. I also tend to slow down when people around me are slower. I just fall into their pace comfortably and tend to not push. You can totally PR at Avengers/Super Heroes (whatever we’re calling it these days). Good luck!